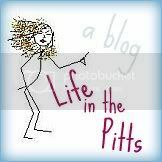 Life in the Pitts: Oh, come on. I'm not THAT difficult to live with. LMAO! That is just awesome. WOW!! He is special :) I don't get that EVER--LOL!! Gotta give it to you... you picked a good one!!!! He mops and reads your blog? I'm so impressed. And slightly jealous. Mine reads my blog strictly to find out what I'm saying about him...but HOW do you get him to mop?? You win! That is AMAZING! :) You got quite a catch! Well Im just outside the Pitts and often downtown for some Warhol etc. Will youns be watching the Stillers tomorrow?...cause I won't. He knows enough to clarify! winner! Um... if Matt does something annoying while we're out I'm like, "Seriously- if you don't tow the line you are definitely getting more lashings later. Don't make me get the restraints this time, either." Seriously. It's nothing but love up in here. Your poor tortured husband. He just wants to finish his mopping first!